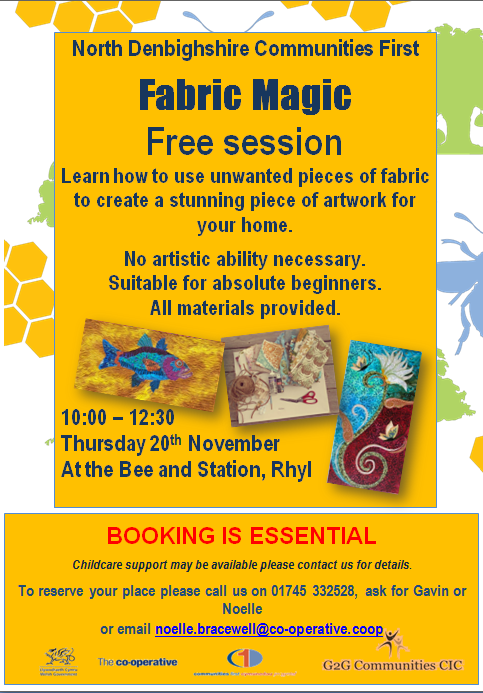 Looking to try something new and creative ? We have lots of taster sessions coming up over the new couple of months. Create a piece of wall art with textiles, suitable for beginners, no artistic skills necessary. All materials provided. Facial care and make-up to help you look great without spending loads of money. * All materials will be provided at no cost. * We can support you with childcare if it would enable you to attend the session. * Due to limited places booking is essential. To reserve your place please call us on 01745 332528, ask for Gavin or Noelle or email noelle.bracewell@co-operative.coop. 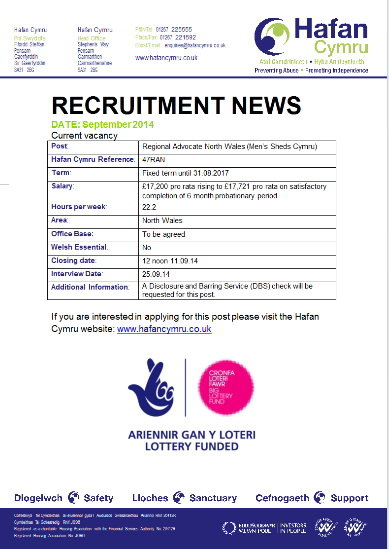 Denbighshire Home-Start requires A FAMILY SUPPORT WORKER Working to an established Scheme Manager Salary £ 17,333 pro rata (NJC point 18) Fixed term contract until October 2015. Home-Start is a voluntary organisation committed to promoting the welfare of families with at least one child under 11 years of age. Volunteers offer regular support, friendship and practical help to families under stress in their own homes helping to prevent family crisis and breakdown. 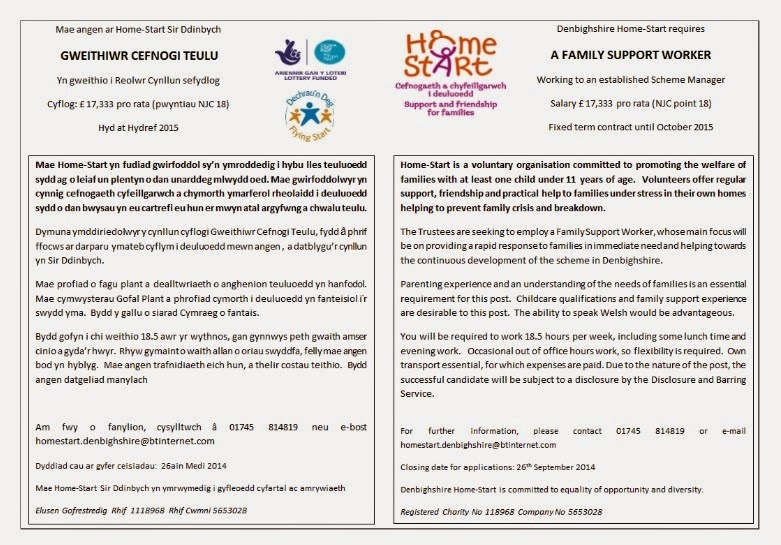 The Trustees are seeking to employ a Family Support Worker, whose main focus will be on providing a rapid response to families in immediate need and helping towards the continuous development of the scheme in Denbighshire. Parenting experience and an understanding of the needs of families is an essential requirement for this post. Childcare qualifications and family support experience are desirable to this post. 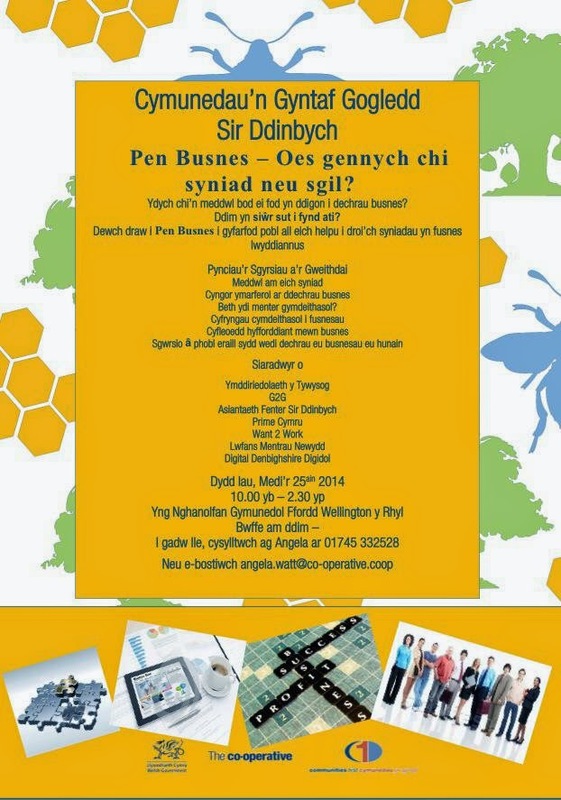 The ability to speak Welsh would be advantageous. You will be required to work 18.5 hours per week, including some lunch time and evening work. Occasional out of office hours work, so flexibility is required. Own transport essential, for which expenses are paid. Due to the nature of the post, the successful candidate will be subject to a disclosure by the Disclosure and Barring Service. 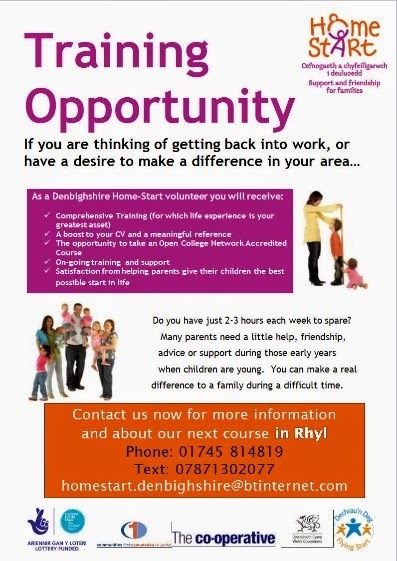 Denbighshire Home-Start is committed to equality of opportunity and diversity. A Disclosure and Barring Service (DBS) check will be requested for this post. There is still a few free spaces for the Thursday 18 September 2014 group so contact us on 01745334482 to book your place. 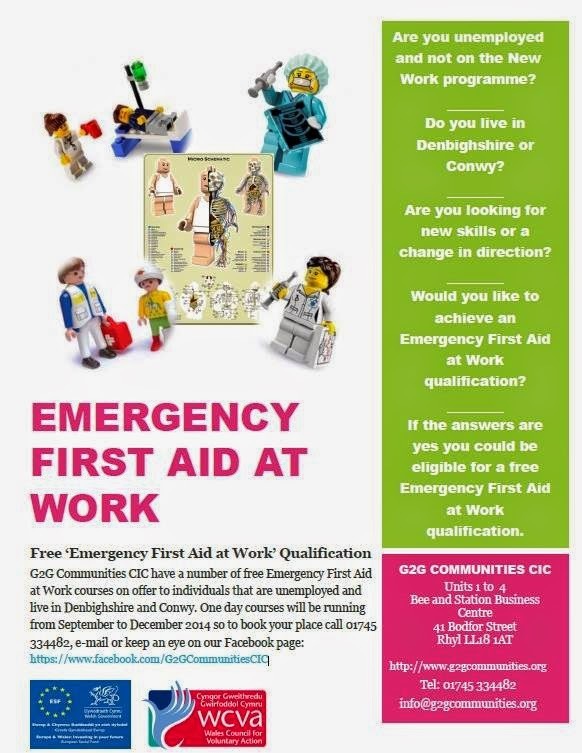 G2G Communities CIC have a number of free 'Emergency First Aid at Wo...rk' courses on offer to individuals that are unemployed and live in Denbighshire and Conwy. One day courses will be running from September to December 2014 so to book your place call 01745 334482, e-mail or keep an eye on their Facebook page: https://www.facebook.com/G2GCommunitiesCIC. Have you got an idea or skill and think you could make a business out of if ? Not sure where to start ? 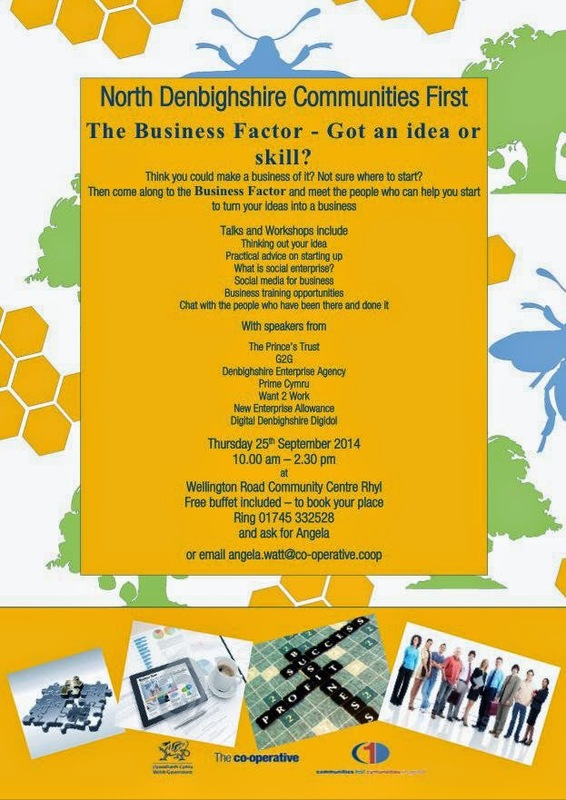 Then come along to the business factor and meet people who can help turn your ideas into a business. Various talks and workshops throughout the day, including : G2G,The Princes Trust, Denbighshire Enterprise agency, Prime Cymru, Want 2 Work, New Enterprise Allowance and Digital Denbighshire Digidol. On Thursday 25th September 2014 10.00 am - 2.30 pm. At the Wellington Road Community Centre Rhyl. To book a place call Angela on 01745 332528 or email angela.watt@co-operative.coop. Come and join in the fun ! Be a part of your community. 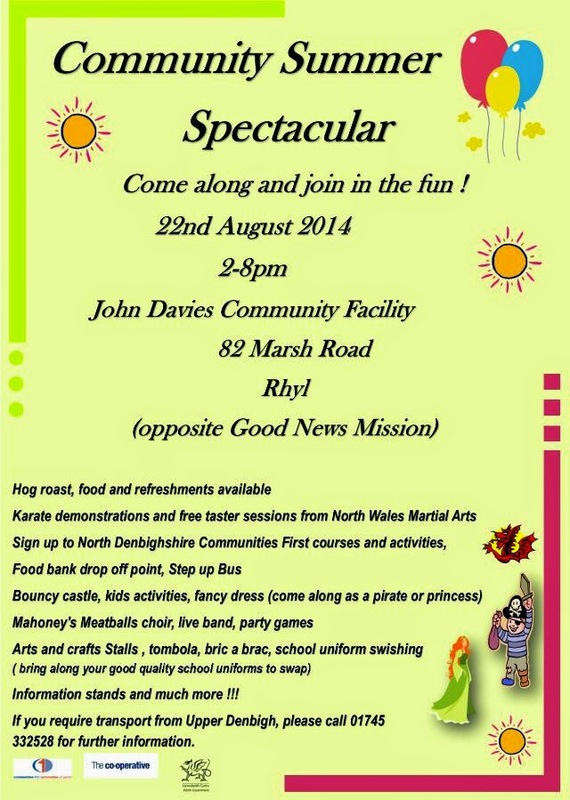 Food, refreshments, music, karate demonstrations and taster sessions with North Wales Martial Arts .Sign up to North Denbighshire Communities First courses and activities, bouncy castle, party games, fancy dress ( dress up as a pirate or princess) school uniform swishing. Bring along and swap your good quality uniforms, food bank drop off point, stalls, information stands and so much more. If you need transport from Upper Denbigh to the event please call 01745 332528 or email Lisa.Evans@co-operative.coop. Please share this with your networks and friends. Free Support to help reduce your energy bills. 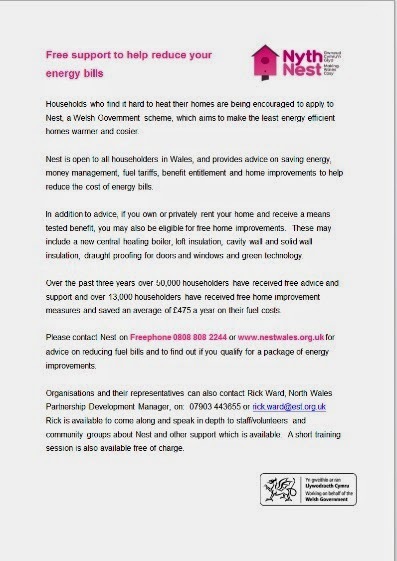 Households who find it hard to heat their homes are being encouraged to apply to Nest, a Welsh Government scheme, which aims to make the least energy efficient homes warmer and cosier. Ne...st is open to all householders in Wales, and provides advice on saving energy, money management, fuel tariffs, benefit entitlement and home improvements to help reduce the cost of energy bills. In addition to advice, if you own or privately rent your home and receive a means tested benefit, you may also be eligible for free home improvements. These may include a new central heating boiler, loft insulation, cavity wall and solid wall insulation, draught proofing for doors and windows and green technology. Over the past three years over 50,000 householders have received free advice and support and over 13,000 householders have received free home improvement measures and saved an average of £475 a year on their fuel costs. Please contact Nest on Freephone 0808 808 2244 or www.nestwales.org.uk for advice on reducing fuel bills and to find out if you qualify for a package of energy improvements. Rick is available to come along and speak in depth to staff/volunteers and community groups about Nest and other support which is available. A short training session is also available free of charge. Is your child aiming for university? How can you help? 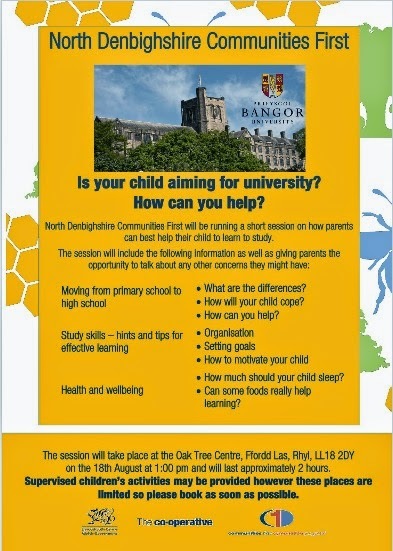 North Denbighshire Communities First will be running a short session on how parents can best help their child to learn to study. How will your child cope? Can some foods really help learning? 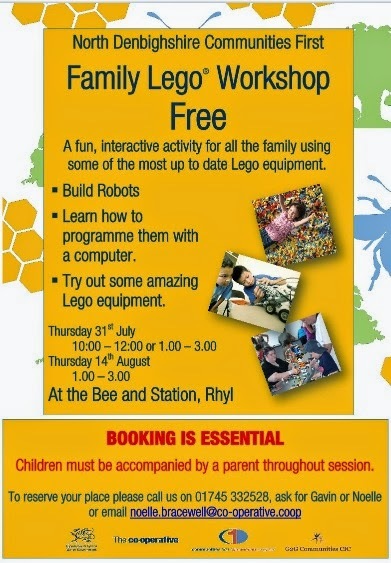 The session will take place at the Oak Tree Centre, Ffordd Las, Rhyl, LL18 2DY on the 18th August at 1:00 pm and will last approximately 2 hours. 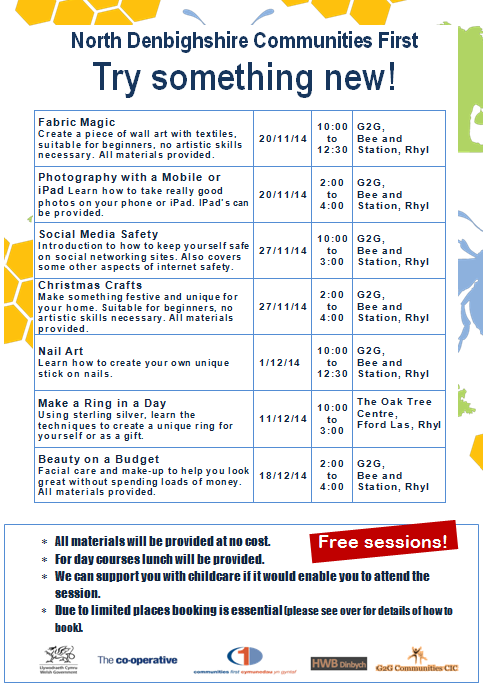 Supervised children’s activities may be provided however these places are limited so please book as soon as possible. 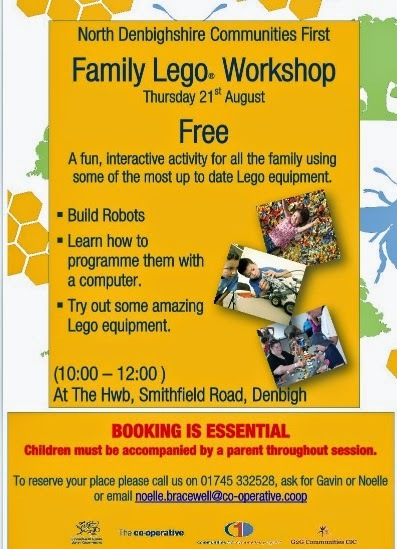 Details of the Family Lego sessions coming up in both Rhyl and Denbigh. 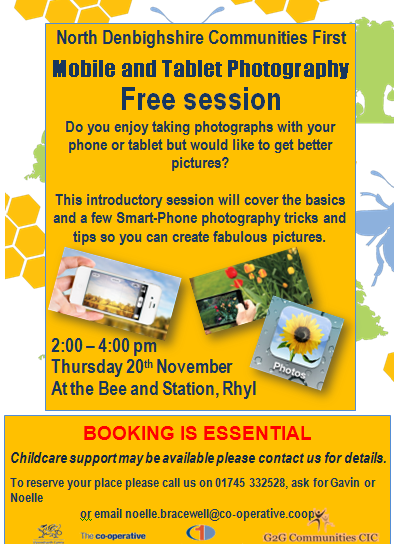 Booking is essential, Children must be accompanied by a parent throughout session. To reserve your place on either session please call us on 01745 332528, ask for Gavin or Noelle or email noelle.bracewell@co-operative.coop. Do you have just 2-3 hours each week to spare? Many parents need a little help, friendship, advice or support durin...g those early years when children are young. You can make a real difference to a family during a difficult time. 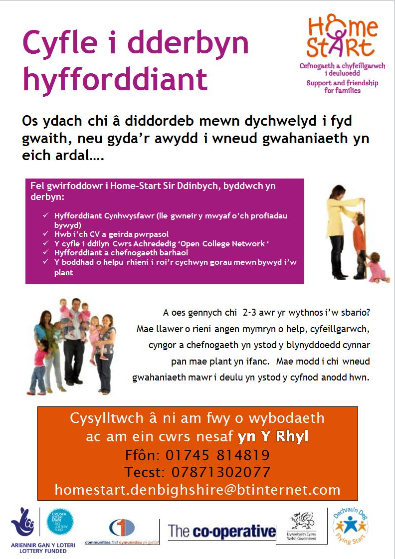 Contact us now for more information and about our next course in RhylPhone: 01745 814819 Text: 07871302077 homestart.denbighshire@btinternet.com. Check out the blog for our unique mobile project! Communities First is a Community Focussed Programme that supports the Welsh Government’s Tackling Poverty agenda. The programme builds on the achievements of Communities First since its launch in 2001 and preserves the best of the current programme. It supports the most disadvantaged people in our most deprived areas with the aim of contributing to alleviating persistent poverty. Communities First Delivery Teams funded by the Welsh Government will work with residents, community organisations, business and other key agencies in these areas, called Clusters, and will focus on actions leading to the long term sustainability and wellbeing of communities. Involving local people in all aspects of this work is an essential feature of the programme. Communities First aims to contribute, alongside other programmes, to narrowing the education/skills, economic and health gaps between our most deprived and more affluent areas.